The Javan rhinoceros is only found in two locations in Southeast Asia: Ujung Kulon National Park in Java, Indonesia and the Cat Tien National Park in Vietnam. 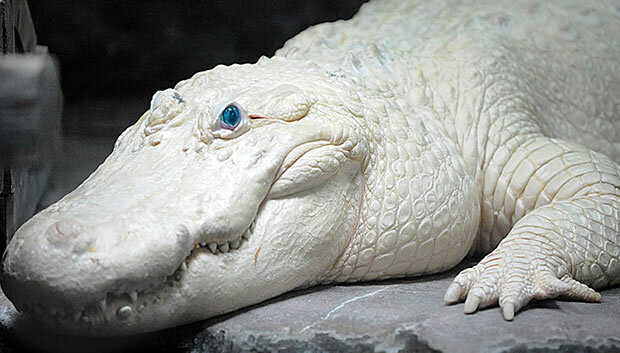 It is a very prehistoric looking animal and also one of the rarest, large-sized mammals. Adults are gray in color and have an armor-plated appearance, which is not really armor, but a result of having large, loose folds of skin. Except for its ears and tail-tip, the Javan rhinoceros is completely hairless. The average weight of an adult is between 3200 and 4400 lb, and the average length is between 9.8 and 11.5 feet. The average height at the shoulder is between 5 and 5.5 feet. Like all rhinoceroses, it has a single horn that reaches up to 9.8 inches long. Female horns are smaller than males, and some completely hornless females have been observed. The habitat preference for Javan rhinos is lowland rain forest with tall grass and reed beds where there is a good supply of water and plenty of mud wallows. In Vietnam, they can be found in hilly areas up to 2000 meters from the ground level, and it is believed that it is a result of human settlement in the lowland areas. Diet consists of leaves, twigs fruits, and shoots. Since the Javan rhinoceros is a very rare creature and the least studied of all rhinoceroses, very little is known about its behavior. Both male and female are solitary, except when ready to mate or when the female cares for her young. Females give birth to only one young and only once every one to three years. It is believed that the gestation period is 15 to 16 months. 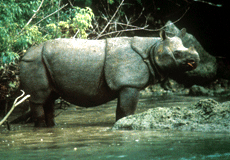 Only 60 Javan rhinoceroses remain in the wild today. They are endangered due to hunting for their horns and other body parts, which are used in Chinese medicine. In some areas, one kilogram of rhino horn sells for approximately $60,000. They are also hunted by locals for meat. The Vietnam population has suffered heavily due to contamination by the Agent Orange and death by land mines and general warfare during the Vietnam War. Until recently spotted in the area, the Vietnam population was thought to be extinct. Today, only five individuals remain in the wild. Although the species is now protected by law, there is still a threat of disease due to inbreeding. Conservations believe that it may be too late for the Vietnam population, which may become extinct in the near future. A second population in Indonesia is now being established to preserve the species as a whole. Copyright Notice: This article is licensed under the GNU Free Documentation License. It uses material from the Wikipedia article "Javan rhinoceros". Glenn, C. R. 2006. "Earth's Endangered Creatures - Javan Rhinoceros Facts" (Online). Accessed 4/26/2019 at http://earthsendangered.com/profile.asp?sp=402&ID=3. Need more Javan Rhinoceros facts?